Distributed Art Publishers (DAP), 9781933045627, 198pp. Expanding upon the ideas he laid out in The United States of Jasper Johns, published in 1996 by Zoland Books, Yau traces the ways that the artist's work conveys a connection to the common experience--a "sense of life" that encompasses thoughts, memory, consumption, excretion, life, death, time and mortality. Yau's readings of the works are broadened by statements from conversations between the poet and artist that have taken place over the course of the last 30 years. Lending to this sense of intimacy, many of the works collected in this volume come directly from the artist's studio or his private collection, and have rarely been reproduced before. According to Flam, "John Yau focuses his attention on how the artist's pioneering paintings relate to life as it is lived--and on what they tell us about what it means to be mortal and alive in time. 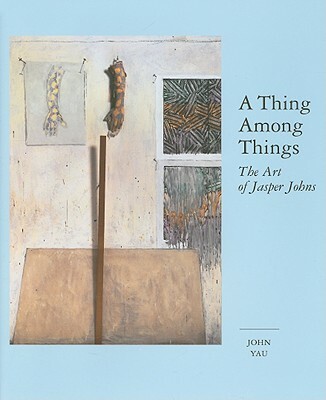 Along the way, Yau cuts a much-needed clearing through the tangle of narrowly self-reflexive interpretations that have plagued so much critical writing on Johns' work during the past half century--providing a fresh approach and opening our eyes to Johns' accomplishment in revealing ways. This is a groundbreaking book, written with both precision and passion. It should be read by everyone who cares about modern painting." John Yau is a poet and critic. He is the author of several books, including The Passionate Spectator: Essays on Art and Poetry, Paradiso Diaspora and Borrowed Love Poems, as well as contributions to monographs and catalogues on Joan Mitchell, Jessica Stockholder, Wifredo Lam and Hiroshi Sugimoto. Since 2004, he has been the Arts Editor of the Brooklyn Rail. He has taught at the University of California, Berkeley, Yale University and the Maryland Institute College of Art, and is currently an Associate Professor of Critical Studies at Mason Gross School of the Arts, Rutgers University. He received a Guggenheim Fellowship in Poetry in 2006-2007.